Abstract: This paper analyzes the relationships between creative design and the field of information visualization, with a focus on historical connotations and newest developments that show great potential. Empirical evidence shows how designers often employ information visualization as a creative concept capable of significantly determining the design outcome, and vice versa, how information visualization can be enhanced by exploring interdisciplinary concepts, such as design cognition, user engagement, aesthetics and art. Several symbiotic dependencies are explained and demonstrated, including the first conceptual cyberspace and information architecture definitions. This paper will argue that information visualization should be enriched with the principles of creative design and art, to develop valuable data representations that address the emotional experience and engagement of users, instead of solely focusing on task effectiveness metrics. Finally, several interdisciplinary movements are described that show great symbiotic potential in the near future, especially in the fields of ambient information displays, informative art and location-based information awareness. Several research approaches demonstrate the close but complex relationships between the disciplines of design and information visualization. On one side, some novel information visualization techniques are emerging that seem to be significantly influenced by creative design, either by artists that attempt to penetrate the field, or by visualization researchers that assimilate insights from related disciplines such as design cognition and art. On the other side, artists and designers increasingly incorporate data collections in their works, as information visualizations are transformed into new media art, presentation tools and even physical architecture. Accordingly, this paper investigates several directions that demonstrate highly symbiotic dependencies. This paper does not attempt to be exhaustive, but instead concentrates on historical connotations and newest developments that show great promise and potential. In particular, this research will demonstrate how creative information visualization uses insights of human cognition and perception to address the emotional state and engagement of users who explore data representations, rather than to solely concentrate on traditional task metrics or algorithmic performance issues. Visualization, the representation of data graphically rather than textually, uses the high-bandwidth human perceptual and cognitive capabilities to detect patterns and draw interferences from visual form. Information visualization has emerged over the past fifteen years as a distinct academic field that is inspired by the fields of computer science, psychology, semiotics, graphic design, cartography and art. Information visualization focuses on various research topics, which all deal with the same problem: the use of visual metaphors for representing the structure of and the relationships within abstract datasets and the interaction paradigms that enable effective navigation inside the resulting representations. Abstract data is characterized by its lack of a natural notion of position in space, and its visualization examples include financial models, textual analysis, transaction data, network traffic simulations and digital libraries. Information visualization thus clearly differs from (scientific) visualization of physical data, which implicitly carries the spatial lay-out that can be simulated by graphical reproduction, such as geographic layouts, architectural plans or medical imaging. As the data is non-spatial and lacks natural representation, the creative design challenge for information visualization is thus to invent new visual metaphors for presenting information and developing ways to manipulate these metaphors to make sense of the information. The original cyberspace concept can be considered as the early predecessor of the symbiosis between design and information visualization. Due to its rapid success throughout many disciplines, the concept of cyberspace became linked to many other imaginative synonyms such as the metaverse, dataspace, matrix, electropolis, cyburbia and cybertecture, rendering the actual term technically unimportant. 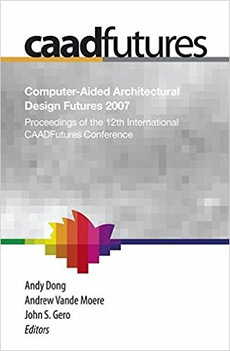 During the conceptual rise of the cyberspace phenomenon, many researchers were convinced that the field of architecture and design, with its vast expertise in areas such as space perception, history and function organization, was the ideal professional and academic field to conceive cyberspace according to cultural and public needs. So-called cyberspace architects, schooled both in art and computer sciences, were destined to develop virtual, social spaces in which humans could meet, work and play. Notably, the first cyberspace definition foresaw that these cyberspace architects were not solely responsible for the static lay-out, appearance, functionalities or three-dimensional design of the virtual worlds. Instead, early cyberspace explorers (Benedikt 1991) described these designers as creative software architects that program sophisticated software simulation algorithms, capable of translating any abstract data, and all interactions with it, into interpretable visual forms. As the virtual worlds were completely built-up out of data, they thus created ‘inhabitable information visualizations’. In fact, the earliest cyberspace definition mentions the most fundamental principles of information visualization, such as the believable mathematical translation of data into graphical counterparts, the generation of meaningful data clusters and the metaphors required to interact with it: “Cyberspace, a consensual hallucination, experienced daily by billions of legitimate operators, in every nation, by children being taught mathematical concepts. A graphic representation of data abstracted from the banks of every computer in the human system. Unthinkable complexity. Lines of light ranged in the nonspace of the mind, clusters and constellations of data. …” (Gibson 1984, 67). Obviously, this cyberspace definition can be interpreted as a predecessor of imaginary, creative information visualization: an immersive environment consisting of experiential data structures, offering users a believable, engaging and comprehensible model for interactive data and information-organizing aesthetics. Designers often unconsciously use information visualization in different ways, for instance as a presentation and analysis tool, as a basis for architectural principles in virtual space, or even as the governing framework of real-world designs. One of the earliest stages of a traditional design process consists of preparation, investigation and analysis, in which the designer typically locates relevant data and facts to have a better overview of the design problem and to frame possible end solutions. The resulting data collection often contains information in different media types, and includes many contextual parameters that surround the design question. Some designers use this dataset to analyze special features or explore possible remarkable relationships that might be hidden within, to determine and contextualize design decisions. As shown in Figure 1, typical examples include site investigations, in which several abstract features (e.g. activities, flows, planning restrictions) are traced, recorded and interpreted, or electronic project management environments, which enable the organization of document collections (e.g. timelines, reports, images). Often, designers represent these datasets using information visualization principles, as the goals of both fields then closely overlap. However, many of these design-oriented representations differ from traditional data representation approaches in the careful attention on visual design, aesthetical quality and user engagement, and the exploration of novel visual and interaction metaphors. Since the first use of the term ‘architecture of information’ in 1976 by Richard Saul Wurman at the national conference of the American Institute of Architects (AIA), many conceptual connections between architecture, design and information handling have emerged. Currently, information architecture mainly denotes a professional field that deals with the functional, technical and content specifications of multimedia applications such as websites and information interfaces. It conceptually differs from information design as it focuses on structural rather than presentation issues, although both fields attempt to communicate complex ideas with clarity, precision and efficiency. Consequently, the popular definition of information architecture neglects the architectural meaning in the classical sense, which points to the skilful designer of social spaces who received a background in theory, history and functionality of issues such as presentation, interaction and form interpretation. However, some computer-literate architects still consider the term information architecture to denote the usage of ‘architectural principles’ to design and structure data in such a way that the retrieval and exploration of information becomes more effective. Notably, this definition comes close to both that of the analysis/presentation applications mentioned in Section 2.1, although takes into account architectural design knowledge and spatial experiences to design visualizations, instead of focusing on task efficiency and algorithmic optimization. Figure 1. Infovis for design presentation & analysis. Left: programmatic site analysis (van Berkel and Bos 1999), right: project management (Stouffs 2001). Architects have to be competent in both structuring buildings and preparing effective presentations of space, so that people are able to experience the carefully designed qualities of well-considered architectural compositions. Both physical architecture and information architecture have the wish to create liveable, workable and attractive environments. Both fields consider all functional requirements, often referred to as constraints, which a design has to fulfil. These are collected into a socalled program, a term that started to play an important role in the architectural movement towards functionalism, following Louis Henry Sullivan’s concept of ‘form follows function’ and Le Corbusier’s comparison of a house with ‘a machine for living’. Just like architects have to be aware of the occupant’s needs, organize those needs in a coherent pattern, and design a space that meets these expectations, information architects gather, organize and present information to serve a well defined purpose. Consequently, information architecture is not that different in that respect: it addresses the structural organization and effective presentation of data into valuable and meaningful information. Similar to the original cyberspace definition, this implies that information is considered to be a raw material and the only reality is a virtual one, turning the computer into an instrument, infrastructure and design environment (Schmitt 1999). Architecture is then considered as a synonym of structure, and information architecture as the field that organizes and presents the ordered, accumulated data. Consequently, one can imagine the concept of ‘form follows data’, or the use of bits as virtual bricks, not only in the context of exploring formalistic data-mapping principles, but also to detect and aesthetically translate inherent structures hidden inside datasets, and to learn the qualities of new visual languages that represent these. Figure 2. Real-world buildings as information visualizations. Left: Moebius House (van Berkel and Bos 1999), right: Dutch Pavilion (MVRDV). The concept ‘forms follows data’ can even be uncovered within physically built architecture, as a demonstration how far information visualization influences the concept and formality of inhabitable designs. Examples include, next to information displaying dynamic facades, displays, billboards and lighting effects, van Berkel and Bos’ Moebius House and MvRdV’s Dutch Pavilion at the World Expo 2000, both depicted in Figure 2. Both buildings are examples how analytical data can be literally translated into an architectural program and formality, shaping perpetual daily activities, or layering the essential features of a country as a human-scale information visualization. Currently, most information visualization research efforts are mainly focused on task metrics measurements, usability enhancements and organization algorithms for massive amounts of raw data. As research increasingly dealt with such efficiency and convenience considerations, assimilation of insights taken from other disciplines, such as interaction design (e.g. new input devices), multimedia art (e.g. user engagement) and computer graphics (e.g. hardware advances, rendering algorithms) seem to have been neglected. However, this section will explain how design is slowly but increasingly influencing significant aspects of information visualization, and will demonstrate how spatial designers can apply their knowledge and experience to create engaging, aesthetic and meaningful data representations. Some information visualization researchers attempt to incorporate insights from design-oriented cognitive studies to enhance the effectiveness of data representation techniques. For instance, Gosset and Chen (2004) developed a novel colour compositing technique that makes colour blending more intuitively understandable for chart-based visualizations (Figure 3). As most visual designers might notice, and although no real acknowledgements are mentioned, their contributions seem to be, maybe unconsciously, influenced by advancements from colour theory and human visual perception. Other researchers strongly believe that effectiveness and aesthetics may not be as independent as they initially seem. Healey et al. (2002) have investigated artistic insights from disciplines such as human psychophysics, art theory and history to learn how people perceive the world, and how artistic designers capture people’s attention by evoking emotional responses. As a result, they propose engaging weather data visualizations (Figure 3) that vary along an emotional dimension while tracing the changes in effectiveness to represent data. Figure 3. Design cognition in infovis. Left: paint-inspired color mixing (Gosset and Chen 2004), right: art-inspired weather chart (Healey and Enns 2002). Metaphors in visualizations are used to help users understand systems in conceptual terms they already know, by appealing to initial familiarity and experience. Spatial metaphors try to exploit the unique human ability to organize objects in space, using spatial cognition and perception. Since long, visualization experts have incorporated known theories of space perception and way-finding to present users with data representations that attempt to be immediately understandable and easy to navigate. Accordingly, several data representations are known that use a city structure to spatially organize data, made by both visualization researchers as well as designers, such as Cybernet’s file system representation or MvRdV’s Data Town (Figure 4). Other visualization experts argue that familiar data-mapping metaphors hide useful information, are different to scale up and inherently imply certain levels of real-world interaction methods that are difficult to implement. As shown in Figure 5, data can be presented by very abstract metaphors, which appeal to eye, are user engaging and provoke novel ways of exploration. We propose that such data representations need to be assessed using evaluation criteria that move away from traditional efficiency considerations: maybe users need more time to fully understand them, but enjoy this (longer) time span more, learn complex insights by playing, retain information longer or like to use the application repeatedly. Figure 4. The city as a data mapping metaphor. Left: file system representation (Russo Dos Santos et al. 2000), right: Data Town (Maas and MvRdV 1999). Figure 5. Creative information visualization. Left: USA Interactive statistical data (Rashid and Couture 2000), right: TextArc (Paley 2002). New media has lead to the translation of all existing media into numerical data accessible through computers, resulting in graphics, moving images, sounds, shapes, spaces and texts that have become computable. New media art uses the computer as a medium, generating art objects that are inherently programmable. In this field the connection between content and form, or content and the interface, becomes always motivated and merges into one single, undividable entity. Consequently, this concept calls for an appropriate translation of content into specific interpretable forms, a need that is also identified by information visualization. However, instead of focusing on the structural and effective representation of datasets, new media artists rather deal with the aesthetics and the emotional qualities that can be conveyed to users. These insights have led to the conception of info-aesthetics, which analyzes the aesthetics of information access as well as the creation of new media objects that aestheticize information processing (Manovich 2001). Info-aesthetics even considers existing computer interfaces, often not designed by artists or interaction experts, as true forms of art, calling them the modernistic, monumental artefacts of the contemporary information society. This concept suggests that a specific form of aesthetics exists in everyday information tools and interfaces. More importantly, it argues that computer applications employed in industry and science, such as simulation, visualization and databases, are new cultural forms of the information society. Accordingly, we propose that these software tools should not only be designed by interaction engineers and software experts, but that designers are required to create novel forms of information art, that appeal to user engagement and aesthetics and provoke long and enjoyable usages. The informative art movement consists of specially designed, computer – augmented or – amplified, works of art that are not only aesthetical objects but also information displays, in as much as they dynamically reflect information about their environment (Redström, Skog, and Hallnäs 2000). The employed visual metaphors typically include the manipulation of known art (Schmitt 1999)styles, mapping parts or properties of the composition to different sources of data, then letting it change over time. In a similar way, the concept of ambient displays ports information visualization to the built environment. Ambient displays are abstract and aesthetic displays portraying non-critical information in the periphery of a user’s attention. Following the concept of morphing architectural spaces and surfaces into interactive ‘interfaces’, such displays are capable to present information within a space through subtle changes in light, sound and movement, which can be processed in the background of awareness (Ishii and Ullmer 1997). Consequently, this research ports several aspects of information visualization into new realms of design, hereby incorporating the concepts of aesthetics, architectural space experience and multimodal interaction metaphors. Similarly, Figure 6 shows wind-generating pinwheels that represent flows of electronic data as blows of wind, and a projected ‘wallpaper’ that is both a public, aesthetic painting as well as a slowly changing representation of activity levels captured by non-intrusive microphones. Figure 6. Ambient information visualization. Left: Phinweels (Dahley, Wisneski, and Ishii 1998), right: Activity Wallpaper (Skog 2004). A general tendency exists to combine newest computer science technologies, such as virtual reality, tangible interfaces or computer vision techniques, for creative design processes, or to combine aspects of user engagement and user experience, as seen in game and multimedia design, with modern software applications. However, mainly due out of a strong focus on task effectiveness considerations and the multitude of unpredictable influential factors when employing cutting-edge technology, information visualization has been assimilating these insights remarkably slowly. Nevertheless, in the information society of today, users tend to enter the digital realm either for social activities or to perform some sorts of information processing, and this over longer periods of time, requiring new forms of information architecture design. In addition, we can perceive a current trend in portable input and output devices that trace, store and make users aware of a rich set of informational sources. So-called ubiquitous computing is moving into the direction of location-based information awareness, enabling users to both access and author dynamic datasets based upon a geographical context through electronic communication media. Many people are unaware of these invisible, but ever-present abstract data layers that trace our everyday presence in multiple data dimensions, including shopping habits, communications, transportation activities or emotional states. Soon other design research fields, such as urban planning, want to visually represent and analyze this location-based knowledge by adding user experiential and sensor-tracked datasets to their otherwise lifeless and static urban models. Building automation services enable spaces to react to dynamic, physical conditions or external data sources in real time. Currently, these interactions are programmed by engineers, and imply simple action-reaction rules, such as the control of lights, security or climate control: what would be possible if these tools are offered to designers, concerned with the emotional experience of people? Consequently, as the built environment is converted into information interfaces, designers are becoming the ideal experts to interpret the collection of spatially acquired, abstract datasets and to develop suitable data representation metaphors that create ambient, spatial and inhabitable experiences. This paper has collected several contemporary movements in which design influences information visualization, or vice versa, in which data representation significantly determines conceptual design. We have demonstrated that design is starting to force information visualization approaches to consider interdisciplinary issues, such as the engagement and mental immersion of users, the use of design cognition insights and the role of aesthetics in the effectiveness of data representations. Vice versa, the design field should be more aware of the principles and developments in information visualization, as these would significantly render them more effective. Evidently, more research is required to detect and predict how theories, historical analysis and experiences taken from artistic disciplines such as design can support further developments in the field of information visualization. Benedikt, M. 1991. Cyberspace: First steps. London: MIT Press. Dahley, A., C. Wisneski, and H. Ishii. 1998. Water lamp and pinwheels: Ambient projection of digital information into architectural space. In Conference on Human Factors and Computing Systems (CHI’98): 269-270. Los Angeles, USA: ACM. Gibson, W. 1984. Neuromancer. New York: Ace Books. Gosset, N. and B. Chen. 2004. Paint inspired color mixing and compositing for visualization. In IEEE Information Visualization (Infovis 2004): 113-117. Austin, Texas: IEEE. Healey, C. G. and J. T. Enns. 2002. Perception and painting: A search for effective, engaging visualizations. IEEE Computer Graphics & Applications 22, no. 2: 10-15. Ishii, H. and B. Ullmer. 1997. Tangible bits: Towards seamless interfaces between people. In Conference on Human Factors in Computing Systems (CHI’97): 234-241. Atlanta, USA: ACM. Maas, W. and MvRdV. 1999. Metacity / Datatown. Rotterdam: 010 Publishers. Manovich, L. 2001. Information and form. Internet. Available from www.manovich.net/ia/; accessed September 2003. Paley, W. B. 2002. Textarc. Internet. Available from www.textarc.org; accessed November 2004. Rashid, H. and L. A. Couture. 2000. USA interactive. In Understanding, ed. Saul Richard Wurman:324. Newport: Ted Conferences. Redström, J., T. Skog, and L. Hallnäs. 2000. Informative art: Using amplified artworks as information displays. In Designing Augmented Reality Environments (DARE 2000): 103-114. Elsinore, Denmark: ACM. Russo Dos Santos, C., P. Gross, P. Abel, D. Loisel, N. Trichaud, and J. P. Paris. 2000. Mapping information onto 3D virtual worlds. In International Conference on Information Visualisation: 379-388. London, England: IEEE. Schmitt, G. N. 1999. Information architecture basis and future of CAAD. Basel: Birkhäuser. Skog, T. 2004. Activity wallpaper: Ambient visualization of activity information (poster). In Designing Interactive Systems (DIS). Cambridge, USA: ACM. Stouffs, R. 2001. Visualizing information structures and its impact on project teams: An information architecture for the virtual AEC company. Building Research & Information 29, no. 3: 218-232.
van Berkel, B. and C. Bos. 1999. Move – UN studio. Amsterdam: Architectura & Natura. Andrew Vande Moere is an Assistant Professor in Design Computing at the Key Centre of Design Computing and Cognition, Faculty of Architecture, Design and Planning at the University of Sydney. His research interests include data visualization and visual design, from screen-based media to wearable applications. His teaching comprises interaction design, physical/wearable computing and 3D real-time multimedia. Andrew is also the sole author of the information aesthetics weblog, a website collecting intriguing forms of representing information in engaging and beautiful ways.